Maharishi Vidya Mandir, Ranibagh has been established in the year 1993 and is situated VILLAGE&POST- AMRITPUR, DISSTT- NAINITAL , Maharishi Vidya Mandir area of Ranibagh in 2.0 acres of land with vast infrastructure, state of the art facilities including audio visual teaching system, computers, library, reading room, music room, art room, Transcendental Meditation hall, yoga hall etc. Maharishi Vidya Mandir, Ranibagh like all other Maharishi Institutions is established to introduce Maharishiji�s Consciousness Based Education System in mainstream school education to its students. This system (MCBE) has been tried, implemented successfully and is repeatedly verified by over 600 scientific research studies conducted in 215 universities and independent research institutions of 35 countries. These studies have been published in 6 volumes and have documented the remarkable benefits of Consciousness Based Education e.g. greater use of intelligence, superior brain wave functioning, faster learning ability, faster reaction time, coherent thought process, longer retention of knowledge, improved health and reversal of aging. 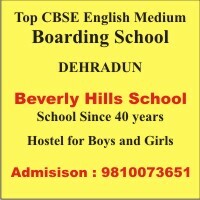 Maharishi Vidya Mandir, Ranibagh is affiliated to CBSE Delhi (up to class 10th). The school has obtained NOC No. 436/ APRIL/2002 on 29.04.2002 from the C.B.S.E. The school has a unique approach to complete and holistic education. The genius of Maharishi school curriculum is that every student studying different subjects identified by the NCERT and Central Board of Secondary Education, seamlessly integrates these with Supreme Science of Life�Vedic Science and Technology.